Summary: An East Asian fantasy reimagining of The Evil Queen legend about one peasant girl’s quest to become Empress–and the darkness she must unleash to achieve her destiny. Review: There’s something about retellings of the Evil Queen legend from Snow White that almost always captures the imagination. She’s a fascinating figure — evil, beautiful, and destined to be undone by some sweet girl with a taste for apples. The retelling that haunts me the most is Neil Gaiman’s chilling short story. 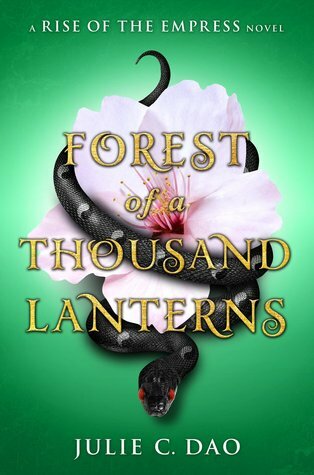 I think it’s safe to say that Forest of a Thousand Lanterns has usurped that particular throne. This story, influenced by the culture and history of Imperial China, is beautifully written — fitting for a story about a surpassingly beautiful empress-to-be. It tells the dark path Xifeng must take to rise above her humble origins and become queen. Of course, that path is not easy. Xifeng struggles to free herself of the evil within her, along with the voice of her abusive aunt who all along has pushed her to pursue her powerful destiny and her conflicted feelings for her love, Wei. She’s a sympathetic figure, torn between her loyalty to the flawed people in her life and her unyielding ambition. As you follow along with her struggles, it’s easy to forget the framework of the story and who she’s meant to become – the Evil Queen from Snow White. And at other times, it’s not so easy to forget. Xifeng’s ambition means that she regards most women as beneath her in one way or another, and she often does or says things that are cruel and vicious. At the same time, the conniving, backstabbing nature of the imperial court means that no one — except for, like, two men early in the story — comes out looking good. And I don’t know how I feel about one key (super spoilerly) reveal and its implications. This is definitely a tale told from the perspective of a rising villain, and no punches are pulled. At least for me, it’s hard to be comfortable with that. Finally, I have to mention the worldbuilding. The details and imagery is just gorgeous. Every mention of a meal left me hungry (sugar dusted persimmon cakes! want!). This, along with the hint of the future Snow White storyline, is why I’m looking forward to the sequel. I’ll definitely be keeping an eye out for that. If you love a good fairy tale reimagining, you’ll want to check this book out.